his weekend was jam-packed—full of meetings with painters, contractors, gardeners, and of course, Antique shopping. I stopped by Dovetail Antiques in Cashiers, N.C. and found these lovelies. I'm considering this amazing door for the entry. 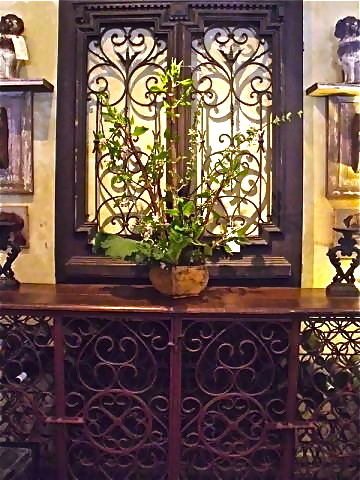 The long, narrow, iron wine storage table will be in the entry, also! I love the beautiful Ichibana arrangement of Apple branches and rhubarb done by Keven Hawkins of Cashiers. What do you think about these antique windows that have been converted into mirrors? There are a pair of them–beautiful. And a pair of doves, too—that Sally! 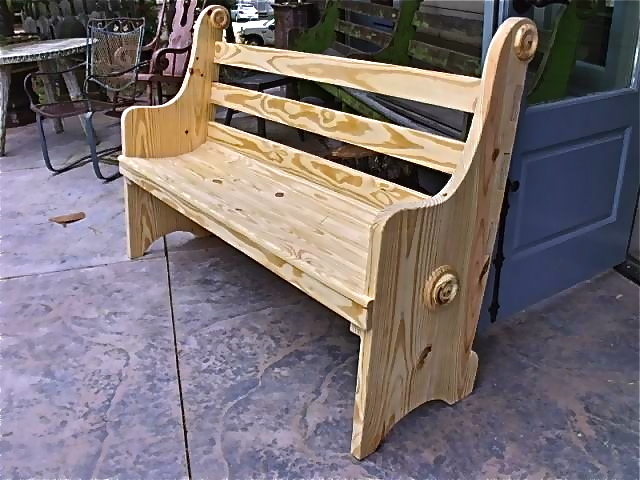 And how about this new bench Sally modeled after an antique French church pew. They are available from Dovetail Antiques in Cashiers, North Carolina. 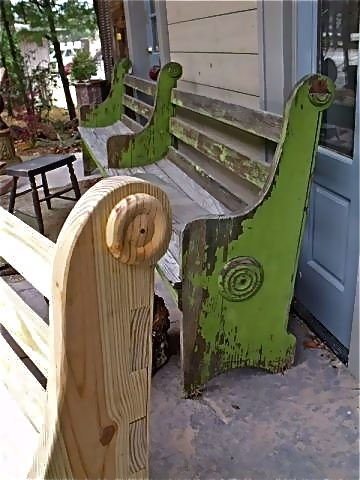 I think I need two of these for my front porch! New bench along side of its antique French cousin. The original green paint is Tres Magnifique! I love combining my two favorite things–renovating and antique shopping. I’ll be starting soon on the house in North Carolina–well, as soon as the Atlanta kitchen is finished. I think I have a renovations problem–what do you think? Wow! Big Score! Love the shops around there! Did you go to Francie Hargroves? Nope, I don’t think you have a renovations problem. I think that you have everything in hand and that as soon as you see it, you have a good feeling about what you want. Go with those feelings! Nope, no problem that I can see! I think that you have everything quite in hand and that you know what you want when you see it. Don’t let any boring people change your mind – just go with what is inside you. I think you have a zest for life and a true passion for renovations. You really are your own contractor. Can’t wait to see what’s next. You don’t have any renovation problems you can’t solve, please keep us informed . You have a special talent ! !